2012 Porsche Boxster UK review | What Car? The third-generation Porsche Boxster is new from the ground up, promising better dynamics and efficiency and more comfort and practicality than the model it replaces. Weve already driven the more powerful S version in Europe, but this is our first chance to review the base model on British roads. 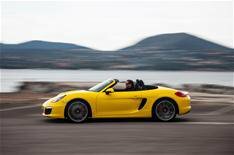 The new entry-level Boxster swaps its predecessor's 2.9-litre flat-six engine for a 2.7, yet it develops 261bhp (up from 252bhp) and sprints from 0-62mph in just 5.8 seconds. The top-of-the range Boxster S sticks with a 3.4-litre flat-six (producing 311bhp compared with its predecessor's 306bhp) and blasts from 0-62mph in 5.3 seconds. Add the PDK double-clutch semi-automatic gearbox with Sport Chrono pack and youll shave off a further half a second. Whats the 2012 Porsche Boxster like to drive? A blast. Even the standard model feels seriously quick and can rightly claim to be one of the worlds best sports cars. Whether youre driving it on motorways or tight B-roads, its supremely stable, while its light, responsive steering gives you enormous confidence whatever the conditions. The ride is impressive, too. Even in sport mode, with optional 19-inch wheels fitted, its extremely forgiving and compliant over poorly surfaced roads. The fact that the body is so rigid helps; you don't feel any wobbles or shakes. If we have a criticism of the base model it's that it doesnt sound as good as the S, which has a louder, more guttural howl at high revs. Whats the 2012 Porsche Boxster like inside? The interior is both elegant and understated. Nothing about the Boxsters cabin is overdone, while the finish is outstanding and a big step forward from the outgoing model. The driving position is superb, although there are quite a lot of buttons on the dashboard. With the roof up there's little wind- or road noise, and you don't lose the delicious thrum of the engine or the growl of the exhaust. Roof down, the cabin remains largely free from bluster, as long as the wind deflector is fitted although it seems wrong that this is a cost option. Luggage can be stowed in boots at the front and rear, while in-car storage includes two spring-loaded cup holders stashed away behind a chrome strip above the glovebox. Just don't try to get a can of coke in them; you can't, so youll need to carry your refreshments in a standard-size water bottle. Definitely, but we'd stick with the base model unless money is no object. It's 7795 cheaper than the S and has more than enough poke to keep you hooked. Its a perfect blend of unbridled fun and practicality.